A bathroom is perhaps the wettest place in a house. As such, high humidity levels are common. From mold growth, musty smell, to allergies, the effects of high humidity can pose a severe health risk. Bathroom exhaust fans can do the work, but in most cases, their effectiveness is less than sufficient. Air conditioners make an impressive choice, but not when the weather is too cold. Well, there’s an economical, practical alternative, dehumidifiers. But the big question is – what’s the best bathroom dehumidifier for the job? We rely on research, tests, and user experience to give you the best power to money, and best performance to size compromises. 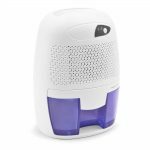 This article covers in-depth reviews of 10 dehumidifiers we deem best for bathroom applications. Plus, we have a guide to help you choose a unit that will function optimally for your bathroom. 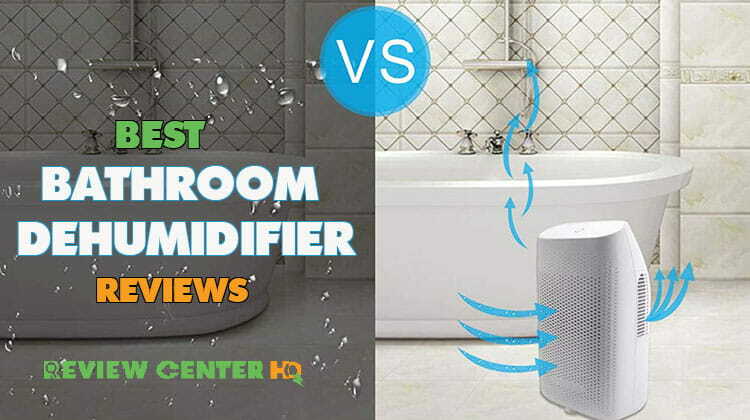 Now it’s time to discover the best dehumidifier for bathroom use and the features that set them apart. Remember, this is the point where you go through the available options and make a choice: a choice that suits your personal need and style. We advise you use the guide section for better selection. Expansive bathrooms, such as those in master bedrooms, can measure over 300 square feet. hOmeLabs 30 pint dehumidifier handles even much more; a whopping 1,000 square feet of the bathroom area. A 30-pint unit can handle extremely wet conditions in a bathroom that’s 1,500 square feet. So, for 1,000 square feet, this dehumidifier is hugely efficient. The storage tank holds 3 liters and is removable for emptying. But when the humidity level is high, and emptying gets too frequent, you can settle for a continuous drain outlet. For this option, you need to make a separate purchase for a drain hose. 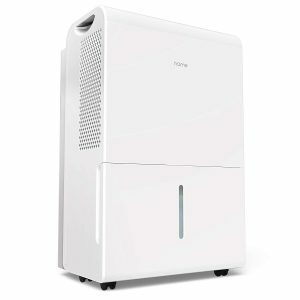 hOmeLabs dehumidifier operates in cycles, with a 3-minute rest period in between. The rest period helps prevent damage. A 24-hour timer lets you set operation time according to the level of humidity. The unit emits heat and can increase the temperature in spaces smaller than 1,000 square feet. It can help warm up your bathroom space when the weather gets cold. A defrost function makes operation possible in temperatures as low as 41°F. Built-in handles and wheels make movement and transportation easy. hOmeLabs 30-pint dehumidifier is quick, effective, and consumes less energy. It keeps humidity level to a minimum, and at the same time, eliminates odors and bacteria. And for such square footage, it can easily handle spaces within and beyond your bathroom. Noise can be a nuisance, in situations where a dehumidifier operates close to a bedroom or study. Hysure makes an extremely portable, whisper-quiet solution. Dehumidifying capacity is 2,200 cubic feet in spaces up to 215 square feet. That makes it a handy choice for large bathrooms and small areas within the house. 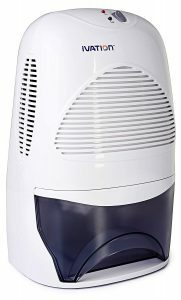 Hysure mini dehumidifier removes 250ml of moisture a day. That makes it a practical choice for moderately damp conditions. The storage tank holds 500ml and can go for at least two days before you empty. When full, it automatically shuts off to prevent overflow. An indicator light lets you know when to empty the tank. Noise level is 37 dB, a level that provides whisper-quiet comfort. Hysure is exceptionally energy-efficient, especially when you factor in its tiny size. Hysure mini is a compact and exquisite unit for flexible application in the bathroom and beyond. It makes an excellent solution for damp environments or areas with high condensation. Programmable dehumidifiers make automatic moisture control a breeze. Ivation 30-pint unit makes a more user-friendly option for the task. It has the same moisture removal capacity as the hOmeLabs unit, but with twice the coverage area. At 2,000 square feet, this compact yet powerful dehumidifier finds no trouble handling more expansive bathroom spaces. The unit removes 30 pints per day. It can handle wet conditions or extremely wet conditions for areas less than 2,000 square feet. The storage tank holds 1.3 gallons. A built-in handle makes carrying easy, even when full. An indicator light alerts you whenever the reservoir is full. An optional hose hook-up saves you the need for emptying. You can connect it to drain to a sink for continuous operation, especially when you’re away from home. Ivation has a user-friendly LCD control panel. Here, you get essential filter and reservoir alerts, all at a glance. Plus, it has a built-in meter that displays the current level of humidity in a room. From this, you can adjust accordingly for automatic moisture control. An auto-reset function makes a smart addition. In case of a power loss, it restarts the unit to its previous setting. A built-in handle and easy-roll casters make moving a breeze, even when full. The power cable measures 6-foot long so that you can use it anywhere. Ivation 30-pint is a smart option for large bathroom spaces. It’s a programmable unit, one that lets you switch to fully automatic operation, especially when you’re not around. Ivation makes a top choice for a no-hassle, tech-savvy bathroom dehumidifier. A more compact and quieter option for a hOmeLabs dehumidifier. For the small size, it makes an excellent choice for moderate damp conditions, where humidity level ranges from 60% to 70%. It’s a great little machine for areas of up to 150 square feet or equivalent spaces of up to 1,100 cubic feet. Working capacity compares to Hysure unit, 250ml of moisture a day. The reservoir holds up to 500ml, and you’ll wait for at least two days before you empty. An automatic tank shut-off makes an impressive feature where you plan to spend a few days away from home. 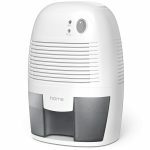 The hOmeLabs small dehumidifier takes care of dampness and musty smell in total silence. It uses a low-noise module, which makes it comfortable for areas within or close to the bedroom. The unit is a convenient choice for a lightweight, portable dehumidifier. It’s energy efficient to keep power bills to a minimum. Though a small unit, hOmeLabs dehumidifier makes a big difference. It packs a big punch in its small size. Plus, it’s incredibly compact, which makes it less obtrusive. Just like hOmeLabs, Ivation 30-pint has a smaller cousin, Ivation IVADM35. It’s more like a scaled-down version, boasting most of the features of larger units. Ivation IVADM35 is a mid-size model ideal for moderately damp conditions. At 2,200 cubic feet, it’s coverage compares to that of Hysure unit. But its rate of moisture extraction is much faster, 20 ounces a day. The 2-liter water reservoir is removable. It serves up to 3 days straight before emptying. The unit shuts off once the tank is full. An indicator light acts as a reminder letting you know when to drain. The unit delivers its power in silence, thanks to top-of-the-line Peltier technology. It’s a system that eliminates moving parts for whisper-quiet performance. With no moving parts, the dehumidifier sits compact and lightweight. Plus, energy consumption is at a minimum. Together, you get a perfect recipe for long-life performance. 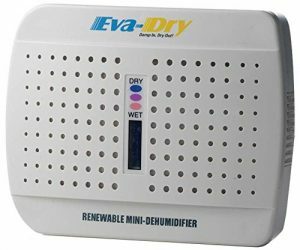 Though not the most energy-efficient dehumidifier out there, Ivation IVADM35 offers reliable performance. Plus, it adapts to most spaces, from the bathroom, bedroom, to the outdoors. Edv-1100 is a scaled-down workhorse, one that delivers a powerful punch while remaining unobtrusive. For such a size, it does an excellent job for small rooms and bathrooms with moderate dampness. For starters, this unit is small enough to fit on a workbench or desk. Plus, it feels light enough to carry, making it one of the top choices regarding portability. At 25 watts, it doesn’t draw much power from your outlet. It’s useful in spaces up to 1,100 cubic feet or 106 square feet. Moisture extraction rate is 8 ounces a day. The tank holds 16 ounces, which means continuous running for at least two days before you empty. There’s an indicator light for “empty” alert. The reservoir is renewable, so no need for expensive refills. Edv-1100 uses Peltier technology, which makes it light and quiet to run. It’s whisper-quiet, so you can have peace of mind when sleeping or studying. Edv-1100 may be petite in size, but not in performance. Add that to a renewable reservoir, and you get an economical and practical solution for bathrooms and small spaces. It seems like Eva-Dry brand likes to go smaller without sacrificing performance. 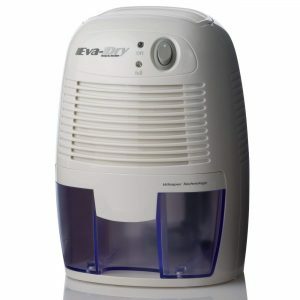 E-333 makes the lightest, smallest dehumidifier on the list. Depending on the specific conditions, it can last 20 to 30 days before renewable. The unit uses silica gel technology, which eliminates the need for batteries or power in the course of the 30-day period. It absorbs 4 to 6 ounces of moisture in one cycle, making it ideal for slightly damp areas. A simple plug-in into the power outlet is all you need to renew the unit. The silica gel crystals function as indicator lights. They’re blue when dry and pink when wet. Pink color tells you it’s time to renew. E-333 makes one of the best buys for users on a low budget. Its price tag is on the low end and can remain operational for up to 10 years. The coverage area is 333 square feet, which is more than enough for large bathrooms. E-333 dehumidifier offers ultra-portable convenience. It eliminates the need for expensive refills and comes at a price that’s gentle on your wallet. For the budget hunter, it’s an option you can’t afford to ignore. A premium dehumidifier with a stylish look that blends in well with any decor. Pure Enrichment makes both a practical and aesthetic option for bathroom areas with 80% relative humidity. 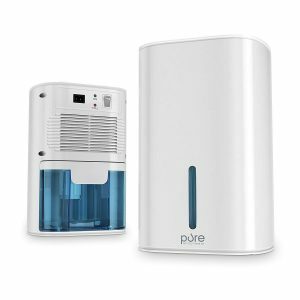 It’s a compact, mini dehumidifier with premium features. The unit boasts a highly efficient humidity control system, one that extracts 10 ounces of moisture a day. A 27-ounce holding tank supports continuous operation for up to 3 days before emptying. The reservoir is transparent for easy monitoring of the water level. Automatic shut-off prevents overflow and overheating. The unit uses whisper-quiet technology, a comfortable feature for quiet settings. Pure Enrichment costs more than most units in its class. But what it brings to the table (stylish Swiss design and premium features) makes it worth the investment. Looking for a unit that offers more than just a moisture control function? Well, you might want to take a better look at iSiLER. It packs a powerful punch in a sleek profile. The unit makes one of the go-to choices to fit in small spaces. Inside the hood is a moisture control system that absorbs up to 1.6 pints a day. 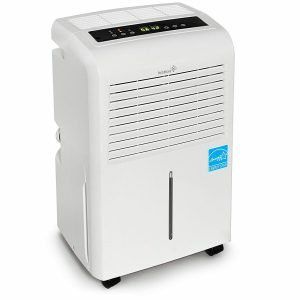 It serves areas up to 107 square feet, almost equivalent to that of Edv-1100 mini dehumidifier. Moisture collects in a 4.2-pint storage tank, capable of serving for at least two days before you empty it. Indicator lights and a single-press button make operation a breeze. 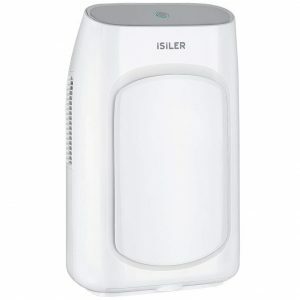 iSiLER has outlets on two sides, a feature that makes it double as a dryer. It dries fast and leaves no odors behind. The whole process is done in a quiet environment, thanks to a 40 dB noise level. iSiLER offers dual functions in one unit, all at no additional costs. The operation is as simple as a press of a button, a handy feature for first-time users. Right from the outside look, the Eurgeen dehumidifier is sure to get your attention. It’s stylish, no doubt, but what it packs inside makes the real catch. Eurgeen is a programmable unit, one that eliminates the hassles of a fully manual dehumidifier. It has a user-friendly interface that boasts LED controls and moisture level display. Moisture absorption rate is 20 pints a day and is useful for areas up to 200 square feet. With such specs, it can handle extreme wet conditions. The tank holds 1.5 liters and has the option of a continuous drain. A 24-hour timer lets you customize the unit to fit your lifestyle. There’s a smart auto-restart function that switches back to the previous setting in case of a power loss. A defrost sensor keeps the unit operational, even in icy conditions. While it’s not the quietest dehumidifier out there, the noise level (less than 50 dB) makes for a peaceful setting. Four easy-roll casters and a top handle make it easier to relocate. 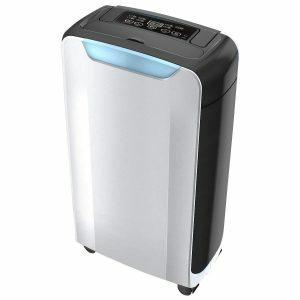 Eurgeen is an excellent mid-size dehumidifier. It’s a specialty unit that offers more for the same price. It makes one of the best compressor-style units for bathroom use. Buying a dehumidifier is an important purchase. And to make the right choice, you need to do a lot of homework. Below are essential considerations to start you off. Most manufacturers state the maximum area over which a particular dehumidifier can operate. It’s often better to settle for a unit with a coverage area more than that of your bathroom. With that, you’ll get better performance, even in excessively humid conditions. Dehumidifier capacity measures the amount of moisture it can remove from the air in a day. Most often, the manufacturer states it according to pints of water. The more the capacity, the more efficient it is at handling humid conditions. A larger tank is better where you want to empty less often. But you’ll have to pay a little more for such convenience. And in case you have a busy schedule, consider a unit with a self-draining option. Heat-exchange coils can frost over when the temperature drops below 60 degrees Fahrenheit. A defrost feature helps prevent such damage. It’s a must-have feature unless you live in a warmer climate. Noise can be a nuisance, particularly when you have a dehumidifier close to a study, nursery, or bedroom. Consider a quiet model by looking at the noise rating. Settle for levels less than 50 dB. Settle for energy-efficient units. A dehumidifier with an energy-star label makes a better option. After all, you don’t want to incur high utility bills. Q: What is the safe humidity level for human comfort? Q: For how long should a dehumidifier run in a day? A: Keep it at 10-12 hours, but the more, the better. Q: What tips can I use to keep the dehumidifier noise to a minimum? A: In the case of a variable speed fan, keep the speed at A low setting. But in doing so, moisture extraction rate will reduce. Q: How far from walls and furniture should I place a dehumidifier? A: Keep it 6 inches away for unrestricted airflow. Choosing the best small dehumidifier for a bathroom can be quite tricky. But, thanks to our review and buying guide, we hope you have one or two models you deem best for your personal needs. Remember, the best bathroom dehumidifier is only as good when you use in the right settings. So, take time to survey your bathroom size and humidity level before you make your purchase. We highly welcome any suggestions or experiences you might want to share.